This tutorial shows how you can recycle plastic newspaper bags into plastic bag yarn or plarn. 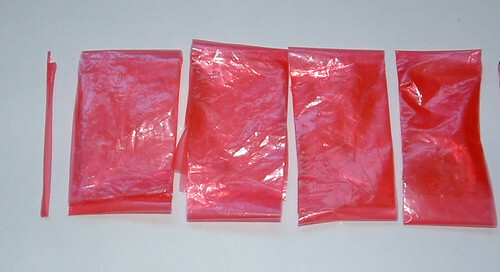 Converting these narrow plastic bag sleeves into yarn is very similar to cutting retail bags to make plastic bag yarn. I have create a picture tutorial outlining the steps below. This method can be used for any narrow plastic bags like newspaper sleeves, English muffin bags, packing pillows and any other skinny plastic bags. The result is short plastic loops that can be joined into one long continuous strip for crocheting, knitting, or weaving. First step is to take the newspaper bag which measures 7-1/2″ wide x 21″ long and flatten it out. Step 2 is to fold it in half lengthwise. Step 3 is to fold it once more lengthwise. Now you are ready for the cutting stage. Step 4 you cut strips 1 inch wide across the short length of the bag. This creates 1 inch wide loops of plastic. Step 5 is closeup of the 1 inch wide plarn loops. Because the end is sealed off, cut a very thin strip at the end of bag to open up the last loop. Step 6 shows how you interconnect the loops and then pull the knot tight. If you cut the strips about 1 inch wide, it will result in about 19 loops per newspaper bag. Once joined together, this nets about 3-3/4 yards of plastic bag yarn per newspaper bag. Continue to add loops to your chain of plarn rings to make your recycled plastic bag yarn for whatever crafting project you may have in mind. Great tutorial for anyone interested in learning to make plarn! I’ve been needing to start doing this myself because I want to participate in Something in the Water (crocheting plarn breasts for eco-awareness) and that’s due soon. Can hardly wait to delve into the stash of bags I have! Many Thanks! Congradulations on not being in the pink. I want to thank you for the tutorials! I will be using your method, and the continuous strip method at an Earth Day event I am volunteering at. Thank you so much for sharing your talent! Thank you for sharing this great idea.I am a teacher in a School for children which are saved from human trafficking in The Netherlands. We want to learn these children skills they can use, if they ever have to go back to their own country. This is a way to learn them how to earn there own money and be more aware of our environment. My grandfather was doing this back in 1971 with bread bags. We had all kinds of plastic crocheted rugs all around the house! I have cut my t-shirts like that and created a one-piece continuous strand of t-yarn. As for plastic bags, I have tried that method but prefer the looping method to create my plarn. It’s just stronger and is a smoother material for me to work with. Hello! I’ve seen this in many blogs but your way of explaining and your bags are the best! I have a blog where I post about recycling stuff and if you don’t mind I would like to feature your bags! Have a nice weekend! Henrietta – Yes recycled tablecloths do work and you cut them into one continuous strip. I don’t use plastic tablecloths but people who do have made plarn from them. There are several post around the ‘Net using plastic tablecloths for recycled crafting projects. What a cool idea, I’ve never heard of this before but it looks very versatile and I love some of the ideas that you have come up with for this material. Great work! I have a question from a practical and time saving perspective. Why do you cut many short loops from the width instead of just a few long loops from the length? Thank you for the tutorial, it is easy and I like the pics. @Linda – If you cut long width you wouldn’t have loops. You only have loops by cutting across side to side of the bag so its a loop which you then attached to each other. You could also cut one long strip but I like the looping (double strand) method. Hope that explains it. Best wishes and I hope you can use this to make yourself something useful. I just love the pretty pink bags that the paper comes in for crafting.